Entering the Victory Theatre, you see a red curtain at the stage and what appears to be traditional seating throughout. Soon it is revealed, that this is not an ordinary theatre experience. Guests at some moments will be both passive viewers as the story unfolds and at other moments they will be fully immersed into the action with moments on screen that are supplemented with lighting effects directly overhead and all around the guests as they view the show. It was our job to make these effects support the overall story and mood and to orchestrate them carefully to never upstage the overall experience. 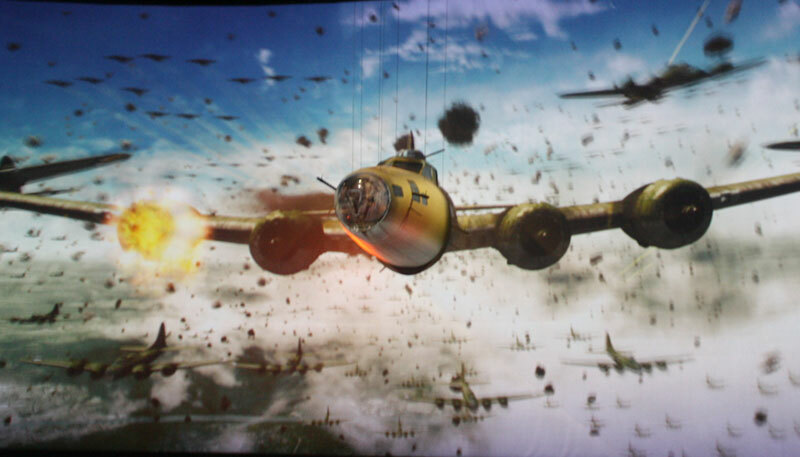 Our favorite moments include the wonderful transformation of the B-17 bomber, and the magical reveal of the ruined city scenery as it seamlessly integrates between the two planes of projections.